This scarf is super dooper long, so you can wrap it around yourself a few times and sport a stylish and fashion-y look. OR you could make it shorter, if you prefer. Or even a few short lengths that you could braid together. Really, the sky is the limit. 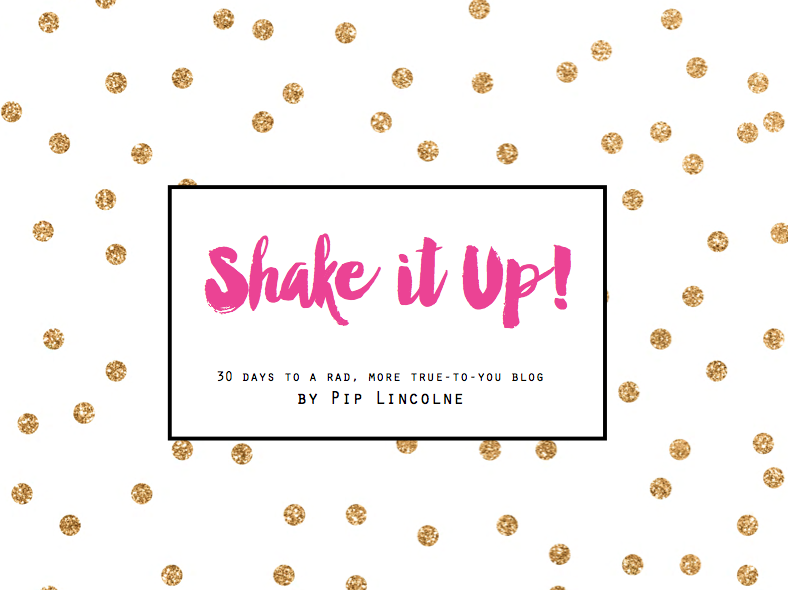 Mix it up and make it your own, once you have the technique down pat. 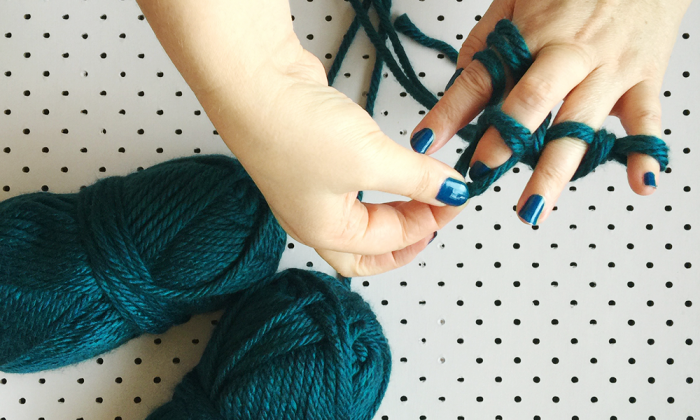 NOTE: We are treating the held-together TWO strands of yarn as if they were ONE stuck-together strand. 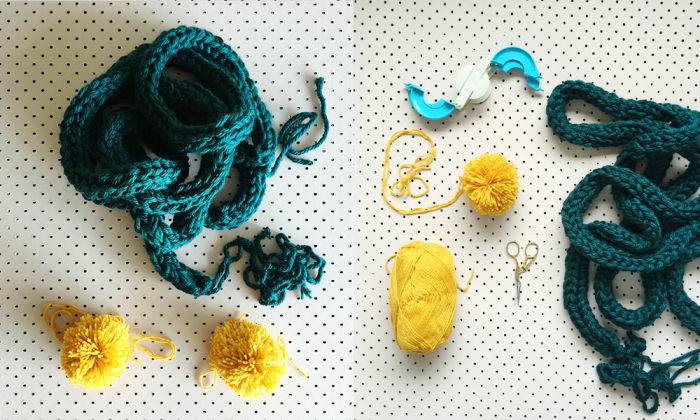 Match the loose ends of your two balls of yarn. Drape both yarn threads over your hand with the loose end tucked between your thumb and forefinger (leave a 20cm tail flapping about!) 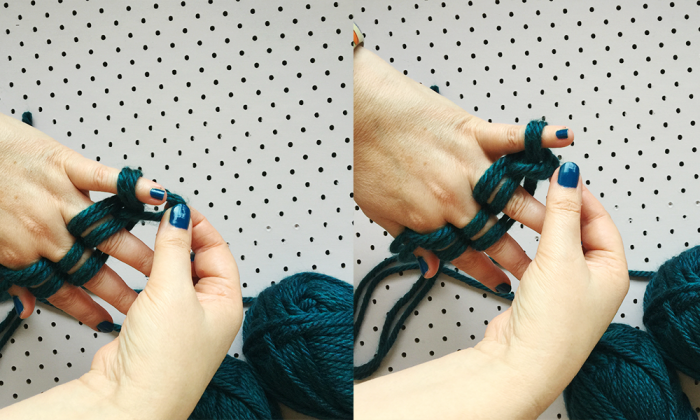 Clamp your thumb and forefinger tightly together to hold the yarn in place securely. 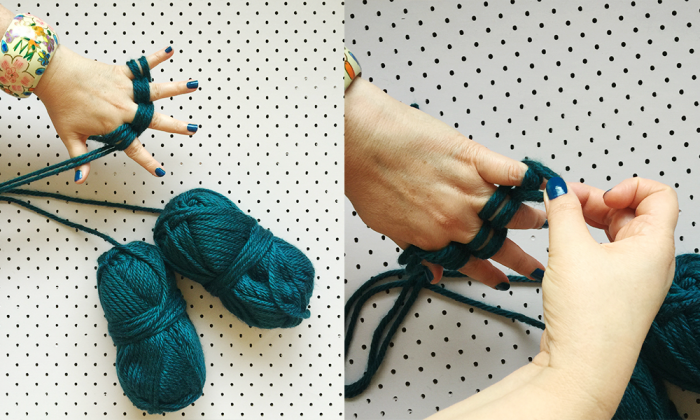 We’re going to weave/wrap the yarn around four of our fingers (not our thumb though!) to create our first stitches. Still keeping the yarn tail pinched firmly between your thumb and forefinger, begin to weave the yarn OVER your index finger (keep pinching so your loose yarn doesn’t come adrift) UNDER your MIDDLE finger, over your RING finger and then RIGHT AROUND YOUR PINKIE. INDEX finger. 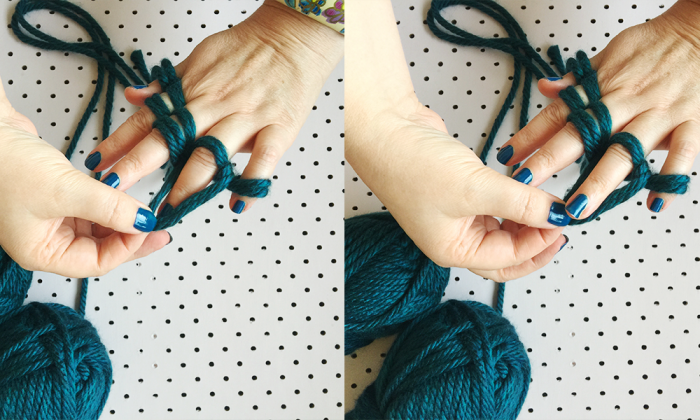 Clamp the yarn (it’s the thread attached to the ball of yarn) in between your thumb and index finger to keep things secure. You’ll have two ‘rows’ of stitches on your fingers – or EIGHT LOOPS – each loop contains two strands. Voila! You have cast on! Hurrah! Knitting Nancy you! Starting at your pinkie, pull or carefully lift the bottom loop up and over the top loop and set it free/let go of it. You might need to bend your finger down a bit to make it work. That is just fine! You now have just one loop on your pinkie. Perfect! You should now have a loop on each of your four fingers. GOOD WORK! Now starting at the pinkie, pull the bottom loops over the top loops one finger at a time until all four fingers have just one (two-strand) loop on them. 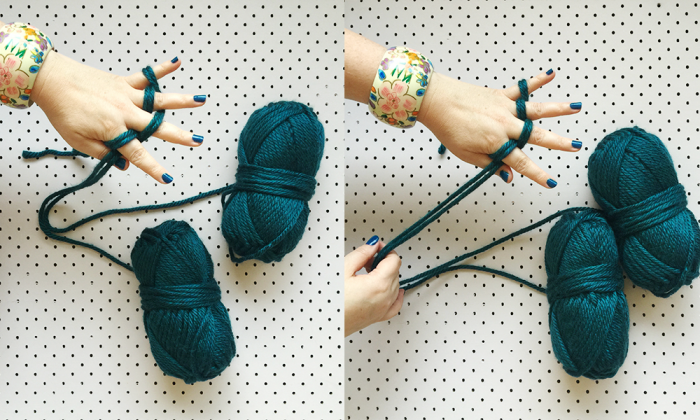 Wrap the yarn over the index finger, under the middle finger, over the ring finger, around the pinkie and under the ring finger, over the middle finger and under the index finger. Then continue on like this, pulling the bottom loops over the top loops starting at the pinkie side of your hand until you have only one (two strand) loop on each finger. Then weave/wrapping the yarn over and under (as described above) beginning with OVER your index finger, under, over, around your pinkie. Then weaving under, over, under back to your forefinger. 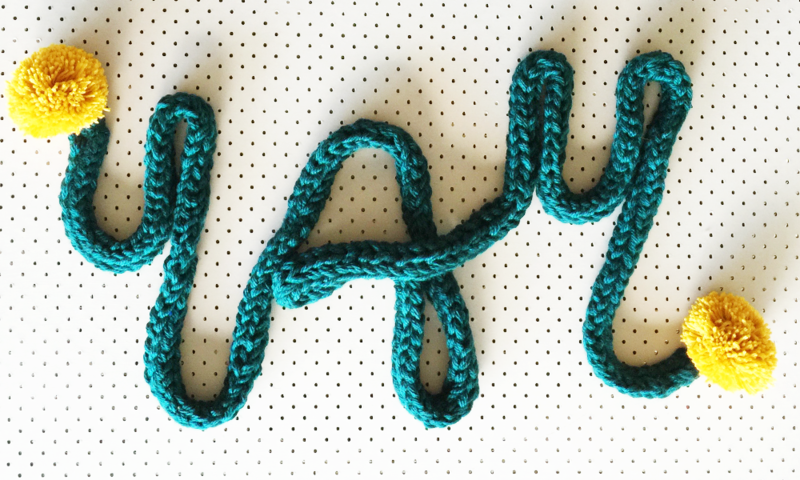 This pattern continues until your scarf is as long as you want it to be! If you need to set your work aside, just loosen your stitches from your hand and slide a pencil or knitting needle (or even a nappy pin) through them to keep them safe. 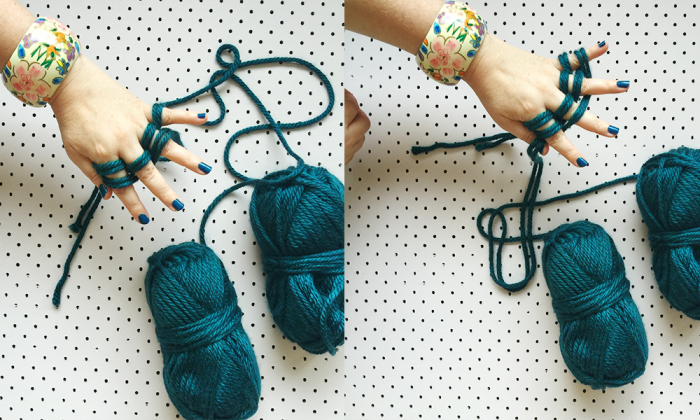 Be sure to tie a piece of yarn at the PINKIE end, so you don’t put yours stitches back on the wrong fingers! 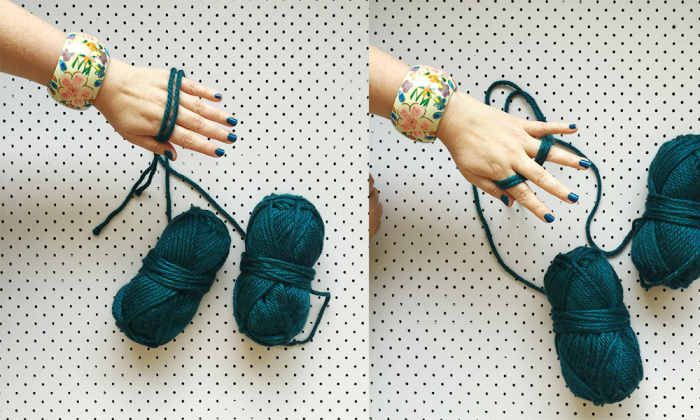 To cast off – Lift the loop off your pinkie and onto the ring finger. Now pull the bottom loop up over the top loop on your ring finger and set it free. Next lift the loop which remains on your ring finger on to your index finger. Pull the bottom loop over the top loop and set it free. Lift the loop on your middle finger off and on to your index finger. Now lift the bottom loop over the top loop and set it free. You have just one loop left now! 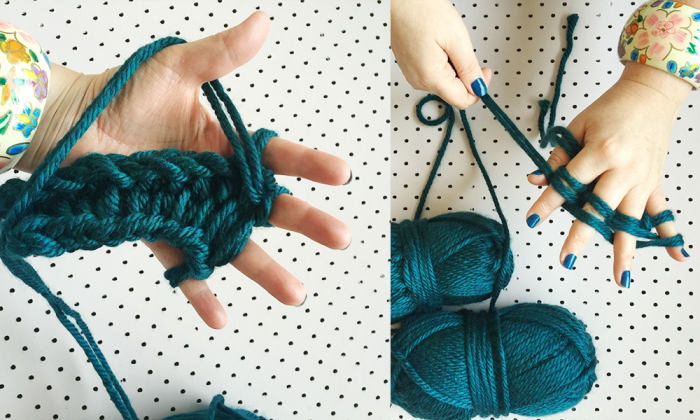 Cut your yarn to form a longish tail (about 20cm) and remove the final loop from your finger. Pull the loose yarn through this loop and pull tight to fasten off. Leave the tail for now. We will use it and then weave it in later. 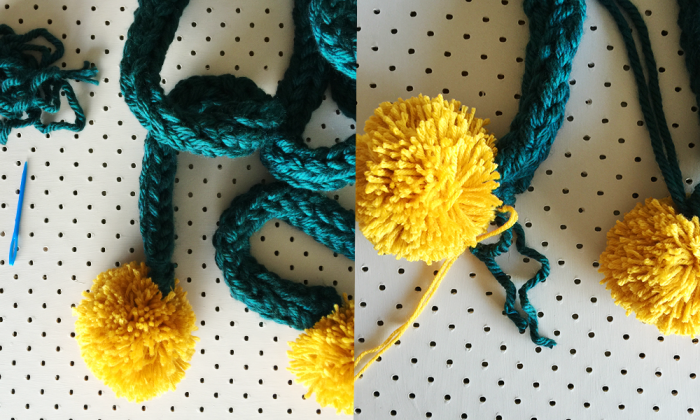 Make your pompoms using the method you most love. and then attach them to the ends of your scarf by threading the loose yarn tail through your wool needle. Stitch it firmly into place using lots of small, firm stitches. 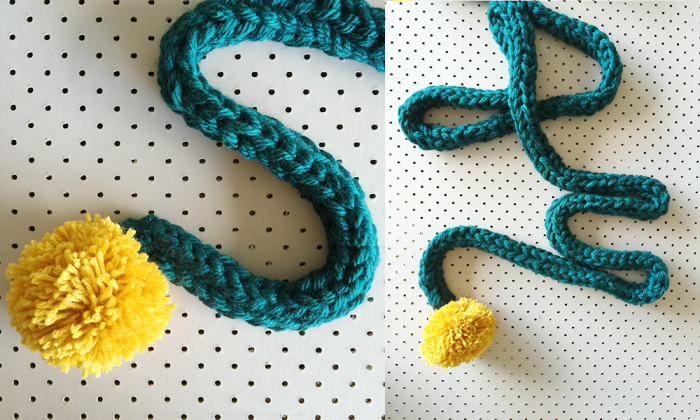 Fasten off and snip your pompom yarn close to where you fastened off. Now take the loose tail from the scarf and use the yarn needle to thread the tail and then stitch OVER the woolly bits where you stitched your pompom on. This will ensure that it all matches. 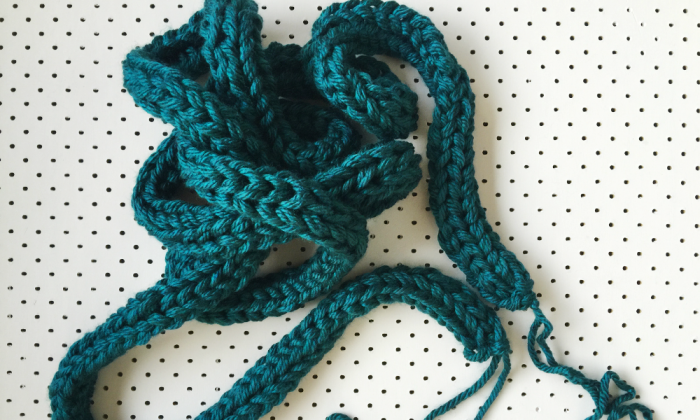 Knot your yarn securely when you are done, trim close to your work and push the knot/loose yarn end into the stitches to conceal. And that’s it! PHEW! What do you think? Did you get the hang of it? Did the video help you make more sense of the instructions? Let me know if you make one, guys!!! How to make a tea cosy! How to make another tea cosy!